LOW EARTH ORBIT—Having stowed away aboard a Soyuz resupply rocket and silently slipped into the International Space Station as part of a high-level fact-finding mission, Secretary of State John Kerry reportedly found himself forced to jettison two Russian henchmen from an airlock Monday after being set upon by the thugs in an ambush that resulted in a violent zero-gravity struggle to the death. “Dasvidaniya, comrades,” a bruised and bloodied Kerry said as he pressed the button to open the airlock, having finally secured the upper hand over his adversaries by launching himself off one of the space station’s structural girders into a weightless somersault, driving his feet into an assailant’s chest, and sending the thug crashing into his accomplice, which caused both goons to tumble into the airtight compartment. 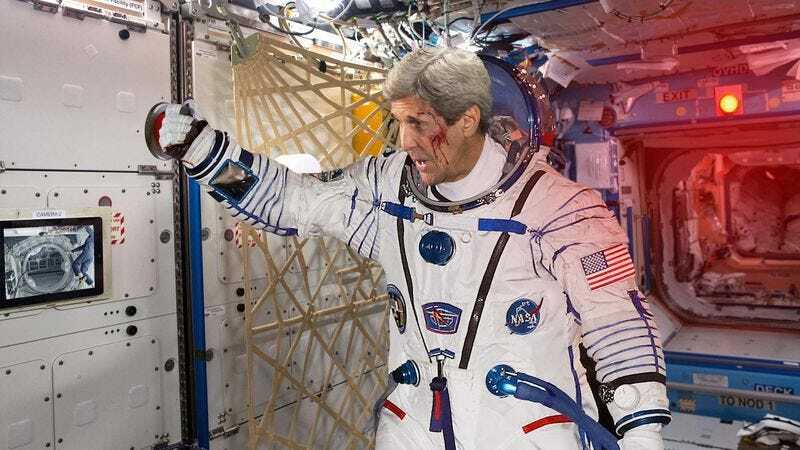 According to reports, Kerry then slammed the passageway’s inner door shut and waited for the five-second pressurization delay, flatly stating “Say hello to Sputnik for me” through the chamber window as his attackers clawed at the opposite side of the glass in terror. After watching grimly through a porthole as the henchmen’s bodies swelled in size and went limp in the vacuum of space, Kerry was reportedly seen rushing over to the controls of the space station’s robotic arm, where he began the intricate process of capturing and disabling an orbiting spy satellite.